There are many people who think alike - so much so that there was a need to patent one's ideas and further copyright them. In the entertainment industry, scripts were safely guarded for this purpose, though once in a while it did go out of hands just like it did in the case of Fantastic Voyage and I Dream of Jeannie. People who have watched the show 'I Dream of Jeannie' in the mid-60's and at a later stage would recall a certain episode 'The Moving Finger' (watch the episode) - in which Major Nelson, an astronaut is approached by a movie production to consult on a science-fiction movie. The plot goes this way: *"An American astronaut, shrunken to the size of a pinhead, is injected into the bloodstream of a Soviet astronaut, works his way to the brain and retrieves information vital to the defense of the country." While the concept is indeed mind boggling and interesting, there was none of it which happened in that episode. It remained just a scene and nothing more. Few months later in 1966, a movie which had its plot based on the above idea was released. 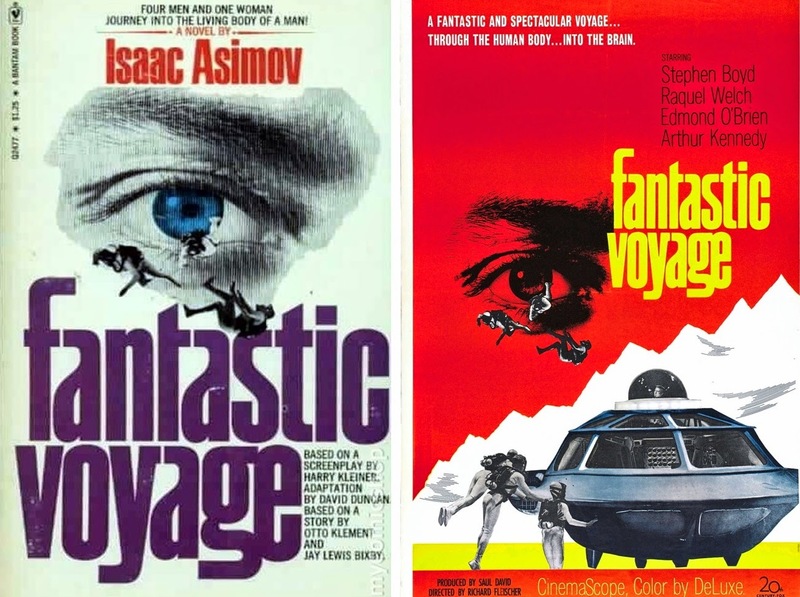 However, Fantastic Voyage as an idea was made on screen based on a story by Otto Klement and Jerome Bixby much before the episode of 'I Dream of Jeannie' aired. The screenplay for the story included few details that would add drama and what better than 'the Cold War' angle. This time the battle between United States and Soviet Union was not on 'outer space', but 'inner space'. Movie on this idea was on and at that time Bantam books had bought the rights to novelise the screenplay. Enter Issac Asimov, the science fiction expert, who was approached to write the novel based on the script. There was hesitation on his part before being offered complete freedom in writing the novel. As it turned out, he was quick to draft on the idea and completed the novel by the end of July 1965. The hardcover edition was published in March 1966 with Otto Klement entitled to royalties as it was his script in the first place irrespective of the fact it was Asimov who pushed for 'hard cover' edition. It was happy conclusion at the end of it all when Klement managed to serialise the story for 'The Saturday Evening Post' and the payment of which was agreed to split into two between Asimov and Klement. Bantam Books who had the rights only for the paperback edition, released the book coinciding with the release of the film. There were delays in completing the movie on time due to various production issues and all this only ensured Issac Asimov to be the biggest gainer at the end of it all. The public were aware of the novel authored by Asimov before the movie being released, and this contributed in believing that Asimov to be the 'genius' behind the idea of the movie. It doesn't matter who was behind what, the movie was well appreciated and for incorporating the special effects inside the human body - a place where no human has ever been to. Fantastic Voyage is indeed 'fantastic' and apart from the outdated on-screen special effects, concept wise, it is an ever green classic!